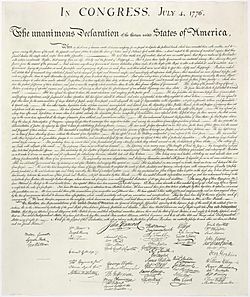 The United States Declaration of Independence is an important document in the history of the United States of America. It was ratified on July 4, 1776. It says that the Americans were no longer under British rule. Instead, the thirteen British colonies came together to become a new country. During this time, many American people were angry at Great Britain. Many Americans did not like paying taxes to Great Britain when they did not have anyone to speak for them in Parliament. The American people wanted to be treated like British citizens. When they were not treated like citizens, they no longer felt loyal towards Great Britain. The Declaration then says that because of all the things that Britain had done to the colonies, the colonies would now be free, independent states. When the King of Great Britain, King George III, and Parliament heard about the Declaration, they were angry. Great Britain and the people in America had already been fighting in a war. This war is called the American Revolution. 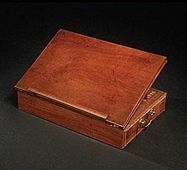 America won the war, and in 1783 Great Britain had to recognize the independence of the new country, the United States, at the Treaty of Paris. The people of America know that the Declaration of Independence is very important. Every year on July 4, they have a holiday called 'Independence Day'. 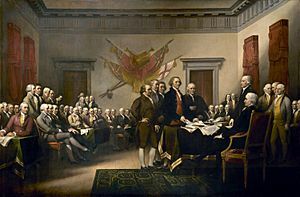 They celebrate this holiday to remember the day that the Declaration was approved, and the day that the United States of America became a its own country. They often celebrate with parades, fireworks, and songs. Sometimes in history, one country has to stop being connected to another country. It has to become separate and equal. This is a right that Nature and God give to every person. However, when this happens, the country should explain its reasons for separating from the other country. That governments which have existed for a long time should not be changed for small reasons. However, if a government abuses its people over and over again, the people have the right to get rid of that government. The Declaration of Independence is very old, but it still exists. 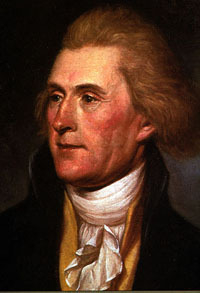 The paper that Thomas Jefferson wrote on is now in the National Archives Museum near the National Mall in Washington, D.C.
United States Declaration of Independence Facts for Kids. Kiddle Encyclopedia.